IFX_Kase Peak Oscillator was created by Cynthia Kase, a well-known American trader. It is included in the Kase StatWare package for eSignals. This oscillator enables a trader to evaluate a large number of various signals suitable for active #trading. IFX_KasePeakOscillator is basically a unique oscillator which in addition to a regular histogram also contains a line indicating lows and highs of a histogram in terms of lows and highs of a price. This line is meaningful when trading against an evolving trend. The indicator’s color change gives a signal to enter the market. If the market is developing the overall bullish trend and the IFX_KasePeakOscillator changed the red color to the blue, it means the right time to buy an asset because the price might grow later on amid the current upward trend. If the market is showing the overall bearish trend and IFX_KasePeakOscillator has changed the blue color to the red, it means the time is ripe for selling an asset as the price might decline later on amid the general downward trend. In case the histogram touches the signal peak line, a trader has to be alert to a price reverse as it has reached its medium-term high or low. If the oscillator’s histogram crosses the zero line from bottom to top, it tells that a general price direction has been changed from downwards to upwards; so, the time is right for a purchase. Inversely, if the indicator’s histogram crosses the zero line top-down it means that a trader should be ready for sales because the trend has reversed from upwards to downwards. 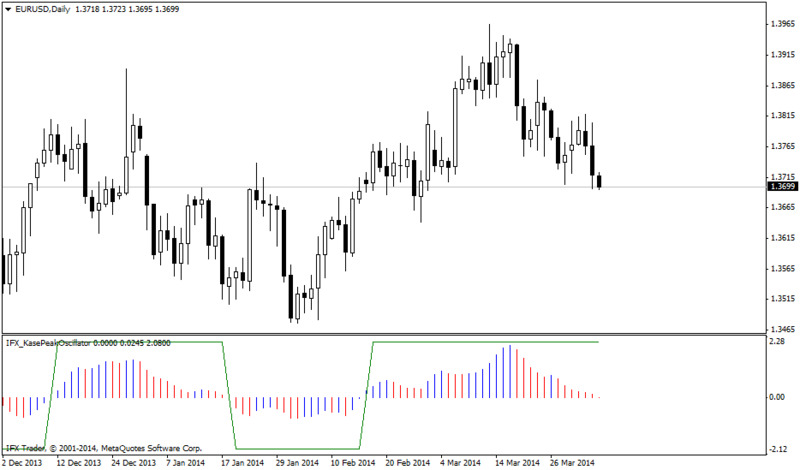 The histogram’s highs and lows can be used to search for classical signals of divergence and convergence. Are there any traders who use this indicator regulary and share their experience?